Beck's identity disk is stolen and he begins to suffer glitches that will eventually lead to permanent memory loss. This episode introduces the city of Purgos, next to Argon City. Purgos is known as a criminal haven. When Beck's identity disk is stolen from him, he begins to lose his memory and suffer from glitches. Without an identity disk, a program is considered a "stray". Tron has to explain to Beck that he'll lose his memories if he doesn't get his identity disk back. It seems unlikely that Beck would not already know this. It must be a fact of life on the grid. The explanation is really there for the viewer's benefit. The pawn-shop-owner/gang-leader called Kobol probably derives his name from the COBOL programming language. The siren called Lux probably derives her name from the SI (International System of units) unit of measurement of luminous flux. 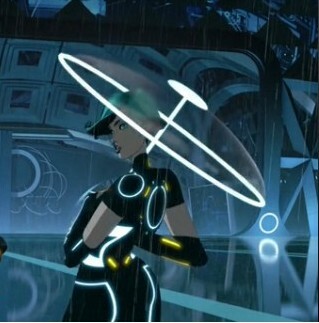 At 12:10 in the episode, notice that Mara is holding a light-umbrella to shield herself from the rain. Tron tells Beck that he was afraid to become Beck's friend because he once let friendship cloud his judgment about someone and he paid a terrible price. Beck guesses that he is referring to Clu, but later episodes imply it was Cyrus, the first program Tron chose to be the Renegade.